Just in case you were wondering and didn’t know, let’s start with the elephant in the room: Yes, Tom Ziglar is the son of Zig Ziglar – the most inspiring motivational speaker ever. Tom has been a part of the family business since the day he was born over 52 years ago, but whilst at university, his goal was to become a professional golfer on the PGA tour. He began working at Ziglar Inc. packing boxes in the warehouse to support his golf habit. From there, he went into production where he made the audio cassettes and VHS tapes which his father’s work would be recorded on. It was his move into sales that he found a new love in his life which, unsurprisingly, came naturally to him. He loves the moral aspects of selling, as it involves looking at a problem which someone has before they have it, and helping them to avoid a bad situation. If you’re not solving a problem, then you’re not doing something ethical. The courses and products they sold, and still sell, make lives better than what they would have been otherwise. He moved up the ranks of the company until at the age of 30, he became the CEO. 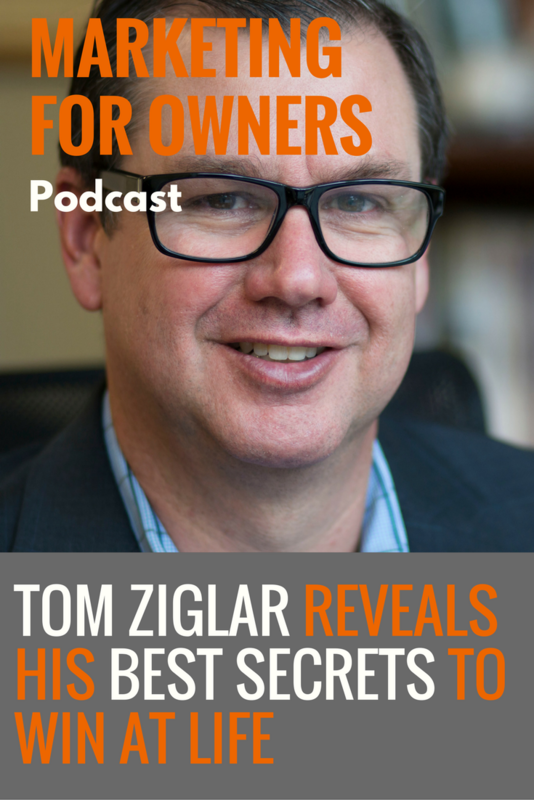 Tom is going to give us personal insights into what it is like being the son of the great Zig Ziglar, as well as sharing his invaluable tricks for actually succeeding and winning in life. You can’t afford to not know what he has to say. It was hard not to feel the pressure when he took over the business from his father. But Zig had always told Tom and his other children that they would never understand freedom until he was gone. While he was alive and in the business, it was all about supporting him and what he did. That meant they all used their skills to keep up what he had created. But throughout Tom’s life, Zig himself never actually put any pressure on him. He only ever told him that whatever he did, be it running the business or as a professional golfer, that he was to do it with 100% integrity and 100% effort. So in that way, he actually always did have freedom. Also, when Tom started speaking 7 years ago, the pressure he felt was enormous and he had never actually wanted to be on stage. That was in spite of being told that he had something to say, and which needed saying. It was hard because of the story which he was telling himself that he needed to be like Zig Ziglar. Tom then realized that it wasn’t true and that he instead needed to be the best version of himself. He may not have the same charisma which he father had, but he had his own style and dry sense of humor. That is when he felt the pressure fall away. In the speaking industry, speakers often suffer from ‘Speakeritis’. It is an affliction which begins when you start to believe everything which people say about you. Sufferers experience a big head and inflated ego. All of a sudden, it is then about you as the speaker, and not the people in the room waiting to hear you speak. It’s a dangerous situation and is usually the beginning of the end of somebody’s career. Early in Zig’s own career, when his first book was starting to take off, he became a born-again Christian which changed his life. Broken in debt and with nothing, he made a commitment that he was going to do it God’s way. Even after all those years of experiencing failure, he still realized that he had a higher purpose, and that was how he kept his humility in perspective. And that’s also why many people loved him, and still do today. Zig’s products are all still available to purchase today, but at Ziglar Inc. the main focus now is certification. It is where they certify people from around the world to come in, learn the materials, and then go out equipped to teach it to others. This gives his messages a wider reach than it otherwise would have. Some of the people who attend are business owners who want to teach it to their workers, while others are speakers and trainers looking for new material. There are now over 200 people who have gone through the program over the past three years. It’s an intense process, with limited class sizes going through the five-day training. They have to walk the talk. When you don’t understand the philosophy, have character or integrity, and not believing that you can get everything you want in life from helping others, you cannot be effective. These are the principles those who are certified have to carry. Of the people who look to Zig Ziglar for help and inspiration, they’re often from all walks of life wanting to find success as executives, business owners, sales reps, athletes, and a lot else. But they all have to know the foundations, which means that whatever they do, they’ll be better, and are on the journey to success. And success isn’t fame and fortune, or influence and money, but rather a balance. People need to successful in them all, and to achieve it, relationships are required. And for relationships, you need integrity, to inspire and lead others, and to set goals. These people want more out of life and need motivation and personal development. There are also those looking for significance which is helping them to do or be more than they thought possible. They have to become a master student of success, and then realize their greatest joy is to be found in helping someone else to do or be more than they thought possible. With legacy, it is the transference of habit, to teach and train the next generation. This could be your own kids, co-workers, or friends. You transfer to them truths, wisdom and values to they can make good decisions that will ripple through eternity. Whether you intend to or not, people will leave a legacy. So the question is how you leave an intentional legacy, and the steps to achieve it. Plus, what do you want to leave? What is the brand and reputation you want your family to be known for, and what is it that sets you apart? The foundational things that make us human have not changed, and remain the same. In fact, we’re even having the same problems which we were having 2,000 years ago. What has changed is science, technology, and the infrastructure, and they are all competing for our time and attention. There is more knowledge and information available now than there has ever before, and we can get it fast too. The problem now is that there is no filter, and there is no way of discerning whether or not it is good information. But any good relationship is built on trust, and that does not change. And trust comes from having integrity. Millennials and Generation Z are smart and want something different to their parents, and that is to have a purpose in their life. The reality is that society would be much better today is we followed in the footsteps of Benjamin Franklin and choose 13 virtues which we felt important, and then worked on improving them. It was Zig Ziglar who said that money is good and important. Money will buy you the things you like, but it won’t buy the things you love. Money will buy you a house but not a home, a companion but not a friend, and bed but not a good night’s sleep. Instead, to truly actually win, you have to succeed in those seven areas of life. How is your mental attitude? Are you optimistic and excited, or fearful and afraid of what might happen? What are you spiritual qualities? Do you have a peace of mind that, even though you don’t know what tomorrow will bring, it’ll work out? Are you getting a good night’s sleep, exercising enough and eating the right things? Are you giving influence and setting an example for your family? If you’re not the right sort of example, you won’t have the right influence. With finances, people generally get their act together either after a disaster (such as your car being repossessed), or a dream (which you make sacrifices for). And I think we all know which would prefer? And finally, when you’re winning in those areas, you win in the personal and the career. But to do it, you have to have a plan so you can then expect to win. Zig coined the philosophy that you’ve got to be before you can do, and do before you can have. So, in order to have leadership as something which naturally flows out of you, you have first got to be a follower and serve others. This is one of the issues that young people are experiencing. They expect to receive a medal just for turning up, and that entitlement doesn’t prepare them for the workplace where they are judged on results. And if you don’t learn to serve from an early age, then the world is going to be tough. Once people see you serve as you grow and mature, they’re more likely to follow you. Having that humility inspires others. Tom is always mindful that he isn’t doing all of this just for himself. There is always a person he meets who has a look of quiet desperation in their eyes, hoping that he has the solutions. These are often the people who come up to him after a speech to ask a question. What they’re doing is trying to see if it is real, or whether you’ve been spouting hot air. All they need is someone to tell them the truth. That’s why, just like Zig, he doesn’t just inspire people but also give them a plan to achieve it. Once someone is told simple truths and then puts them into action seeing results, it builds in a positive way. On top of that, he also likes figuring out the foundations of human performance. Our world makes it in increasingly complex, and to succeed, you need to replace bad habits with good habits. There are three things goal achievers do. They write the goal down, they work on it every day, and they have an accountability partner. Tom does this every day and finds it doesn’t take very long to do. But as a result of carrying out that process, he expects people to benefit from an extra three hours of productivity a week. Even Tom goes back to the Zig’s work for help and finds his first and last books the one’s he returns to again and again. See You At The Top is as true today as it was in the 1970, just like Born to Win from 2012. He also uses How to Stay Motived, which is Zig’s best-selling audio program containing almost 20 hours of content and is Tom’s favorite to go back to. All of Zig Ziglar’s work is still available to buy from the Ziglar website, where you can also find out more information about the Ziglar Legacy Certification and The Ziglar Show podcast co-hosted by Tom. And if you have a burning question to ask Tom, then feel free to drop him an email at t.ziglar@ziglar.com.